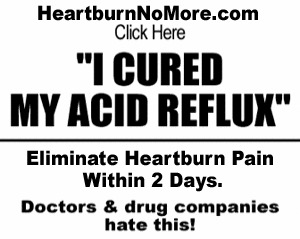 Heartburn or acid reflux occurs when hydrochloric acid and pepsin from the stomach seep into the lower part of the esophagus, irritating the lining which is not suited for the strong acids. Sometimes the pain is mistaken for a heart attack. Acids are allowed to pass into the esophagus because of the relaxation of the esophageal sphincter, a small ring-shaped mus cle that opens to let food into the stomach but closes tightly to keep contents in. This muscle can become weakened. A hiatal hernia can develop in this area, which also causes acid reflux. Eating too fast or too much puts pressure on the sphincter muscle, weakening it, as does too much body weight. 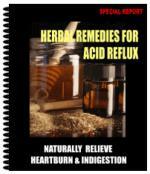 Eating the wrong foods or food combinations can cause heartburn. Foods that can act as muscle relaxants causing the sphincter muscle to open inappropriately are chocolate, fatty foods, and alcohol. Foods that increase the acidity of the stomach are coffee, beer, milk, and colas. Coffee, citrus foods, hot spicy foods, and tomatoes can irritate an already sensitive esophagus. Anxiety and stress can interfere with digestion. It is best to eat 3 hours before lying down. Lying on the left side eases symptoms because the esophagus enters the stomach on the right. Drinking water at the first sign of pain can dilute irritating acids.